Despite its age, we crossed this breathtaking structure in one piece and the “stream in the sky” as it is called became one of the highlights of our short break on the Llangollen Canal. This pretty waterway which straddles the England-Wales border is just one of a network of 2,000 miles ( 3,200 kms) of routes in Britain. In most areas you can rent a boat for anything from a long weekend to a fortnight and see a side to the country that many people imagine had disappeared. Among the attributes of a canal holiday is a pace of life that is slowed to a crawl; friendly people who want to talk and help you along; architecture that is little changed in 200 years; and most importantly, a lifestyle lubricated by endless mugs of tea and jugs of beer! We (myself, wife Lorraine and daughters Caroline and Joanna) boarded our boat “Lynn”, a Duchess class vessel barely a year old, at Black Prince Holidays' Chirk boatyard. Forget any idea of cramped, creaky quarters equipped with bunk beds and camping stoves – this floating home-from-home was 58ft-long and featured one double and two single berths; a kitchen with gas cooker and ‘fridge; full size shower and toilet; a lounge area with armchairs and dining table, TV and – Lorraine's favourite – a very efficient central heating system. One of the best things about canal boating is that you don't need to be a know-all. The boats have remarkably few controls and we were given a thorough briefing about ‘driving' ours – along with advice on mooring, lock operation and safety considerations -- by Pauline, who even set off with us for a few minutes to ensure we were confident. Within minutes of setting out from the boatyard, we had chugged through a narrow tunnel, brewed our first mugs of tea and hauled another boat out of the ‘shallows' with a rope, just like old seafarers! Our first night was spent moored near the village of Trevor, a few minutes walk from a pub called The Telford. Wherever you go, pubs and canals tend to go together perfectly: a source of good-value meals and drinks and a chance to meet the locals. Do remember where you moored your boat, though – and bring a torch – tow-paths are unlit and boats aren't easy to find in the dark. The five miles of canal from here to Llangollen – famous for its International Musical Eisteddfod held each summer – must be one of the prettiest anywhere. The mountains of North Wales rise in the distance, while the waterway clings to the hillside, high above the valley, before diving into a leafy, wooded dell on the approach to town. You can't sail past Llangollen -- it is the ‘head of navigation' in canal parlance. This is a handsome town of typically Welsh chapels and stone-built houses, set beside the tumbling waters of the Dee. We could have ridden a steam railway farther west or taken a horse-drawn canal trip, but chose instead to take lunch in the Corn Mill -- a converted water-mill on stilts above the river – before walking to the romantic ruins of Valle Crucis Abbey, lying in green fields beneath the mountains. In the 13th century, Cistercian monks deliberately sought out this wild and lonely spot for their contemplations. With few exceptions, it was all plain-sailing but we learnt the hard way you can only manoeuvre a boat when moving forwards. When drifting or reversing you have no control over direction – we had a few near-collisions as a result! Our girls loved being part of a team – tying up ropes; pushing the boat off from the bank; switching on the headlight for the tunnels and of course taking their turn ‘driving'. We left Wales briefly, sailing across the border (and another aqueduct) where the Bridge Inn proudly proclaimed itself “the last pub in England”. Our last night was spent moored near another village, in the company of a heron, kingfishers and six snow-white geese. A stroll along the tow-path took us to The Plough, a friendly oak-beamed ‘local' where we arrived shortly before the dominoes club, which set out to demonstrate that this ancient pub game is still practised with skill. On our way back we felt like the White Rabbit from Alice in Wonderland, darting back down the rabbit-hole (tow-path) as we left the ‘real' world of motor-cars and hurrying people and returned to our secret, slow-paced one. Turning our long boat round in a ‘winding hole' on the last morning required all hands on deck – or, specifically, the ropes – even so we managed to leave Lorraine stranded on the opposite bank and had to manoeuvre into the muddy shallows to rescue her. By the end of our three-day cruise we had grown very fond of the canal and its quirky ways. Just before we returned “Lynn” to the boat-yard, we met a couple of guys who had been on the move since July (it was now October). “We've done the Cheshire Ring (a 155 km circle of which the Llangollen Canal is a small part), been up to Yorkshire and over to Manchester,” said one enthusiastically. There was no sign of boredom or boat-fatigue in his tone: “In fact we've rarely been off the canals in 25 years – it becomes a way of life,” he added. I understood what he meant and felt more than a little sad to sail “Lynn” back to the boat-yard. 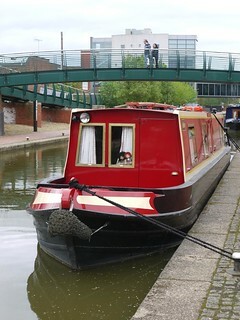 Black Prince Holidays rent boats sleeping two to ten people from five bases in England, Scotland and Wales. All boats are four years old or less and have been inspected by the tourist boards. Prices vary according to size and season, but a four-berth vessel costs from £635 for a week in March to £1,080 in August. Tel: 01527 575115, website: www.black-prince.com . A wide choice of other operators are members of the Drifters consortium (tel. 08457 626252) and details are featured on the website www.drifters.co.uk .